Download the eBook and learn how to simplify your compliance program and stay agile. 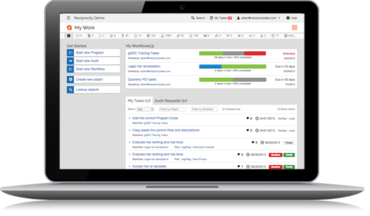 Cloud-based ZenGRC is designed to help you manage your governance, risk, and compliance programs. It was also designed with the end user in mind. The result? The industry's easiest to use, most intuitive product. Affordable hosted software that is flexible and allows managers to act more nimbly and keep up with fast paced business changes. ZenGRC turns corporate compliance from a cost center into a valuable strategic asset that impacts sales and marketing. Get up and running within a month. Scale as you grow with ZenGRC. ZenGRC enabled us to start demonstrating and tracking on-going compliance in a matter of days. See how easy compliance can be.